The kitchen is the last room of our house that needs a make-over. We've painted all the bedrooms, renovated the bathroom, removed or moved just about every non-load bearing wall in the joint, added a deck, moved the front door, turned a wasted front entrance alcove into a sewing room (or study if you buy our house at some point). Not long after moving in we did move the kitchen from its original location into the dining room. It took about five years. The kitchen was the hub of the house and not in a good way. The hall to the bedroom ended in the kitchen, the lounge opened into the kitchen, the dining room was separated by a half-width wall, the back door was in the kitchen. The kitchen and dining room are exactly the same size, but because the kitchen was the cross-roads to everywhere in the house it often felt quite cluttered and busy. Original kitchen looking towards the back door, photo taken from what was then the dining room. 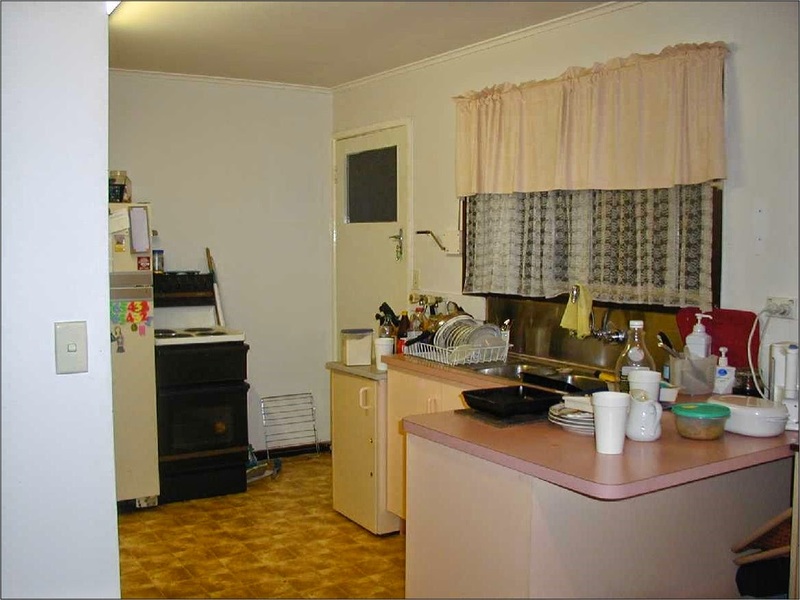 Original kitchen, taken from the same point, but looking towards the hall and lounge room door. The original dining room (now kitchen) on the other hand, is a corner room. We closed off the opening between it and the lounge room, leaving just the wide opening between it and the kitchen (now dining room). We didn't walk in and think, "Oh, that has to move." It was one of those happy 'aha' moments. The stove was on the wall between the hall and lounge room openings, and the back door. A potentially dangerous spot, but there was nowhere else it could go. When the stove died and a friend offered us their old (but good) gas stove, we realised the new stove wouldn't fit there. It was two burners bigger than our old stove. Finally we decided to put the stove in the then dining room, which had the added advantage of us being able to install the gas supply on an external wall. About a year later a friend, who installed kitchens for a living, helped hubby move the two floor to ceiling cupboards/pantries to the dining room. We lived with the half/half arrangement for about four years, before moving the sink and remaining cupboards into the dining room. Our current kitchen cupboards are bit of a mish-mash. We realised quite early on that the existing cupboards wouldn't work long term in the new setting. For one, there was a breakfast between the kitchen and dining room, and we didn't want that. It's currently in a corner, being annoying because it's so deep. For two, the original kitchen didn't have enough cupboards or counter space so some of our cupboards are free-standing bits we've picked up. We've got gaps between cupboards, behind cupboards. And, most annoying for me, very little usable, workable counter top space. Current kitchen, taken from about where the fridges are in the photo above. Current kitchen taken from about the back door (in the photos above). Two years ago we refinanced and included money for a kitchen renovation. Then I was made redundant. Until I have a permanent income, I prefer the money to sit on my mortgage than to be spent. 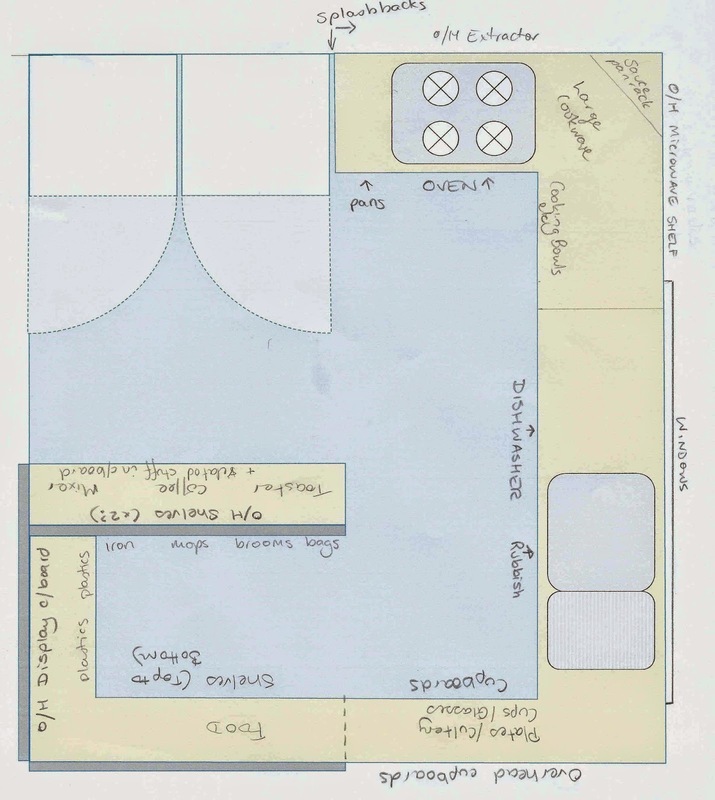 It's hard to eat a new kitchen :-) In the meantime, I've been dreaming and planning. Our kitchen is quite large (3 x 3.6m; ~3.2x3.9 yards) but most of the space is empty floor space in the middle. I've looked at floor work benches, but it would be right in the middle of the work triangle (fridge, stove, sink) and would be really, really annoying. 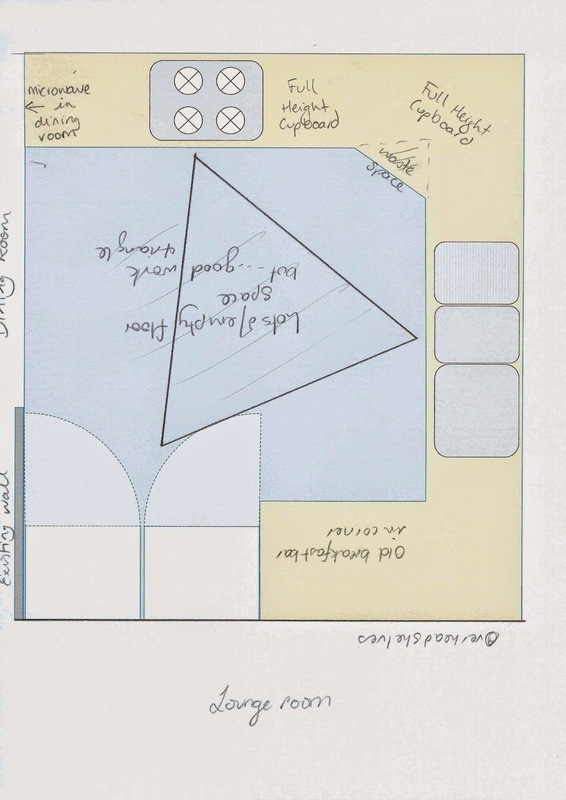 This diagram doesn't show all the mismatched cupboards and gaps, but the photos above do. The dining room is to the left of the plan. The darker grey, thin rectangle (to the bottom left) is the wall between the kitchen and dining room. Behind the fridges (bottom left corner) is a 3/4 height wall. It used to be a walk-through from the lounge to the (then) dining room. We only blocked it with a 3/4 wall to allow for air flow. Behind the sink (grey rounded rectangles to the right) is the kitchen window. On Friday the Girl and I visited Ikea for some bits and pieces (and bought more than we planned). I was wandering through their kitchens looking at ideas, when I realised that most of their display kitchens are about the same size as ours, BUT they include dining spaces or walk-in pantries or big work benches. And then we saw it - a kitchen divided into about thirds, with two thirds as a working kitchen and the other third shelved as a walk-in pantry. The whole kitchen was no bigger than our space. Although in the Ikea design the walk-in pantry was actually a walk-through pantry with one end open and an opening on the side at the other end, I could see just how to make it work in our house. After some fiddling with ideas and masking tape on our kitchen floor, I think I've worked it out. We use the available floor space, instead of it being wasted real estate. Our house is quite small by modern standards, and we can't afford to just have empty space if it can be better used. A walk in pantry. What is not to love about a walk in pantry? Space to store all the bibs-and-bobs we currently don't really have space for - brooms, mops, ironing board. Our "linen" cupboard is a mere 8 inches deep (next to useless). 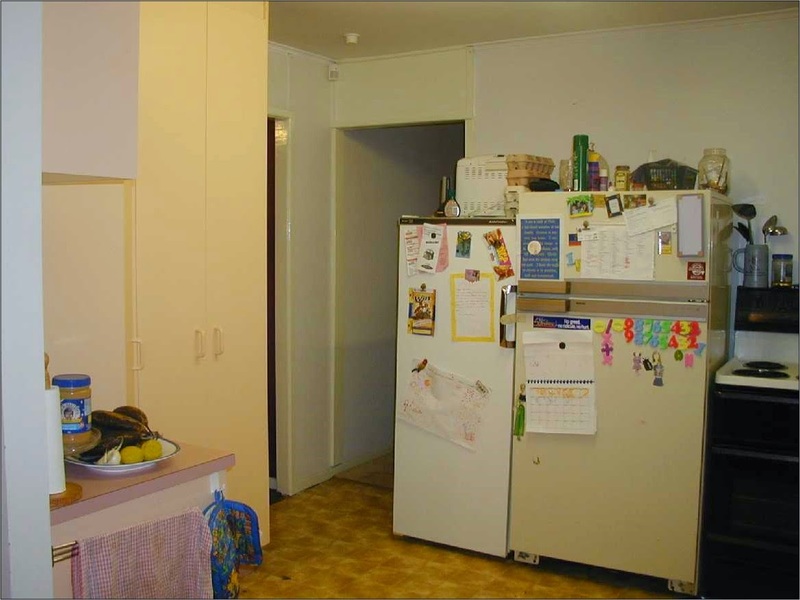 Fewer overhead cupboards - cheaper reno. Shelves rather than cupboards in the pantry area - cheaper reno. The new pantry can be built independent of the rest of the kitchen reno, which means cupboards can be emptied into their new space, rather than stacked in the lounge room or stashed in odd places throughout the house. Hopefully, meaning a less chaotic reno. Dishes will flow from the stove to the sink to their storage. At the moment the sink is really the wrong way around for good flow, with clean dishes flowing towards the stove rather than away from it. A rolling 'baking cart' that lives in the pantry (like this one). The mixer and standard baking supplies would live on the cart, enabling it to be pulled out into the working kitchen area. The shelves in the pantry only being 30cm deep and including a worktop at normal bench height (sort of like this design from houzz, although I think moveable shelves would be more useful). Electrical appliances that currently get put away and pulled out, and put away and pulled out, could actually live on the counter-top and be used in place. Spud storage (like this one) on the end of the recessed narrow bench. A rolling pantry (like this one) between the fridges and the stove bench. It might seem "greedy" when there'll be a whole walk-in pantry, but standard cupboards sizes plus our fridges will leave a gap that one of these will fill beautifully. We thought we could use a heat-resistant, easy to clean material for the backing board to create a splash back between the stove and fridges. Because the whole thing pulls out it would be much easier to clean. So, I'm just here offering encouraging words. Love the willingness to think outside the walls. Our dining room isn't a dining room either. And totally hear you on being cautious with your funds. I refinanced my last house in 08, right before the real estate bubble popped here. I remember being encouraged to take out the loan for much more than I did, so that I could make improvements to the house (which really needed them). I could see how things were going, though, and I didn't want to. So glad I didn't. The market collapsed, but I wasn't backwards on the house because I'd only taken out a small amount of the equity. Made it possible for me to sell the house when my job was reduced 2 years later. Your getting lost is quite possibly due to my appalling editing. You'd never know I did it for an income :-( I always say, "Everyone needs an editor, even editors." My husband rarely 'gets it' when I explain my ideas and concepts to him. I know I've hit a winner with this idea, 'cause as soon as I walked him through it in the kitchen, he 'saw' it. He's even started working out how to make it happen. Almost unheard of! It usually takes him six months to think it over.